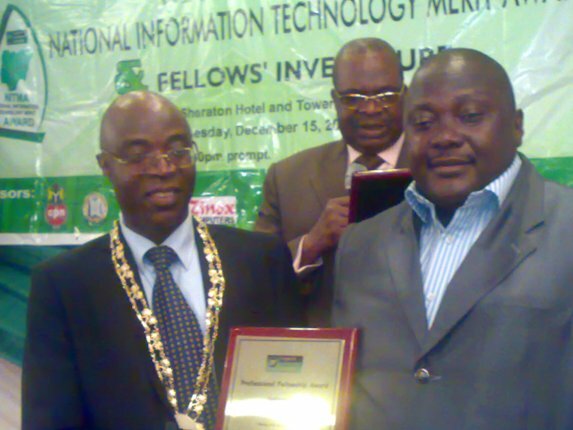 Jide Awe, Founder and CEO of Jidaw Systems, Limited ("Jidaw"), Nigeria's premier Information Technology ("IT") education, consulting, and Internet content services firm, has been conferred with Professional Fellowship of the Nigeria Computer Society (NCS). Fellow is highest grade of the NCS professional cadre. Members of the NCS who became NCS Fellows on Tuesday, December 15, 2009 are: Adeola Olukemi ILECHUKWU, Adeyemi Adebola SALAMI, Chadrill .A. OGBEBOR, Prof.Cleopas ANGAYE, David Esonwa INYERE, Jide AWE, Kenneth Ngozichukwuka NWANZE, Okopedehe Asian UMOBONG, Raphael Ayodele OMOSOLA and Dr. Sylvanus Okwudili ANIGBOGU. Through their investiture they are now members of the NCS College of Fellows (COF). Fellows must have contributed to the advancement or application of Information Technology for significant value to society. The Nigeria Computer Society is the umbrella body for all computer associations in the country. According to the NCS president NCS is therefore the best positioned to present awards in the field of IT in Nigeria. It is intended to be a distinct platform to recognize and honour excellence in the field of IT. The awards are for role models who have contributed positively to the growth of information technology in Nigeria. By celebrating these achievers the NCS aims to encourage the growth and development of professionalism in IT while promoting the development of the IT sector. The NCS president in his speech told awardees in his speech noted that the Fellowship "confers on you a new and higher level of responsibility to the society. Keep the flag of IT flying. Do not rest on your oars." Professor Charles O. Uwadia charged the new members of COF during the prestigious Investiture Ceremony to conduct all their Professional Computer practice and activities in accordance with the Code of Ethics and Professional Practice of NCS as well as to the level of professionalism expected of them as members of the COF. Jide Awe has expressed appreciation for the award and recognition to NCS. According to Awe, it shows that ones effort has not been in vain. "I thank God. I am touched by the recognition because it means that what I have done has had significant impact. It is definitely one of the high moments of my career." "It is recognition not just for Jide Awe but for my family, the in-house team at Jidaw and the larger Jidaw community of students, alumni, members, fans and clients. I must also not forget to recognize those who contributed to my growth and development before Jidaw. Nobody is self made. The award is not just a source of encouragement to me personally, it is a tribute to the Jidaw community and all those driving change through IT. It is hoped that this honor will serve spur us all to greater heights. The award is a call for even more and higher service. Until IT serves an effective tool for pro-people development the work is not finished. Nothing has been settled". Awe promised that he through Jidaw would maintain focus on the mission of "More Power, Better Lives and Sustainable Growth through Knowledge, Technology and quality Values." Jide Awe has significant experience, broad knowledge and vision in the technical and management areas of IT. Before setting up Jidaw he worked at several organizations including: LM Ericsson, United Bank for Africa and Ecobank PLC. He is widely published and speaks regularly on a range of IT policy, development, and human capital issues. He is a recognized authority on IT career development, ICT policy formulation, and Web content promotion. An alumnus of Loughborough University, he is a member of several professional organizations, including the Nigerian Society of Engineers and the Computer Professionals Registration Council. He is a Team Member in the Science and Technology Policy Commission of the Nigerian Economic Summit Group and served a Resource person for Nigeria's ICT For Development (ICT4D) Strategic Action Plan Committee, a Federal Government team tasked with the formulation and development of a roadmap for the implementation of the Nigerian ICT Policy. Congratulations. lt is a well deserved honour. I must say. Keep the flag flying we are solidly behind you. Congratulations once again Sir. Regards to your family and the entire "Jidawites". Congratulations. This is a well deserved award for Jidaw systems. I am proud to be associated with Jidaw systems where I started my IT career and will always go for more. I am using this medium as well to saying congratulations to the entire Jidaw System's staff. JIDAW, Congratulations for the Nigeria Computer Society Fellow Award. You really deserve it. Thank you NCS for recognizing our oga. This Award will definitely benefit us in so many ways. Congratulations on being awarded Fellowship of the Nigerian Computer Society and on the excellent results from your CCNA candidates. May you go from strength to strength in 2010! From NTA Lagos CH10, we congratulate you for the recent Fellow award from NCS. We hope to be involved with you as As part of our new empowerment scheme with ICT. This is a well deserved award for my Oga, I have always known this and many would come. I am proud to be associated with Jidaw systems where I started my career when I was still very very fresh. Jidaw Systems Ltd, you guys are the best. Keep the good work going. Sky is the beginning. Season's greetings. Congratulations! I am seizing this opportunity to express my congratulatory message to you & entire JIDAW over the recent award. More grease to your elbow. Happy Christmas and New year in advance. I just wanted to congratulate you on receiving the NCS PF award. Just heard about it. I think I know for sure that this is not a "paper certificate", (like you always say) .You certainly deserve it sir. HONOUR WELL DESERVED! It is long overdue. Please keep it up! Whatever we achieve is a tribute to all who have contributed to our growth and development. Nobody is self made.